WYSIWYG Ours are loaded with details. Really clear details. Compare a wire harness to these and ours illustrate WYSIWYG or "what you see, is what you get". Our photographs make it oOSOEZ to identify everything. Easily ID wire Circuits, Junctions, Splices, Connectors, Routing, Entry, Gauges, Colors and Locations plus related Minature Bulb and Fuse Sizes. Even look at a Fuse Box and be able to read the writing. When was the last time you could do that? The fuse box lettering is so worn and faded on some, you could not figure what fuse or size goes anywhere. 11" x 17" convenient size for actual use inside, under or even behind dash. Full Color and you can look at these without the eye fatigue staring at itsy bitsy, teeny weenie long meandering closely spaced lines or dotted or even dashed colored lines. (What Corvettes has wires with dotted lines on them? Have you ever seen these Corvette wires with dashes on them? I never have. Must be some special code.) These provide a 3 dimensional view of the deails, not capable of being produced by that the 2 dimensional AIM. Durable clear thick laminate, not a paper sheet, plastic coated on one side. You could not roll these up and stuff them in a tube. Ours are a quality durable guide. Economical Have you ever tried to read and understand the factory AIM or schematics? You actually loose your place before you can even get to the end of the wire. It's just so frustrating. A retired GM executive called them "eye tests". Baseline These oOSOEZ Wiring Guides were developed circuit testing actual Corvette wiring harnesses. These are not reprinted AIM schematics that are notorious for omissions and errors. I know this is a "Novel Idea" - but we tested actual harnesses, instead of copying the AIM and repeating 30-40 year old errors. Fact If you "Colored In" any of the 1956 through 1982 AIM schematics, what have you really got? Pssssssst ... We found on average of 5 to 8 errors for each model year, and you could not even determine what is missing, what is now modified or what anything really looks like or is supposed to look like. 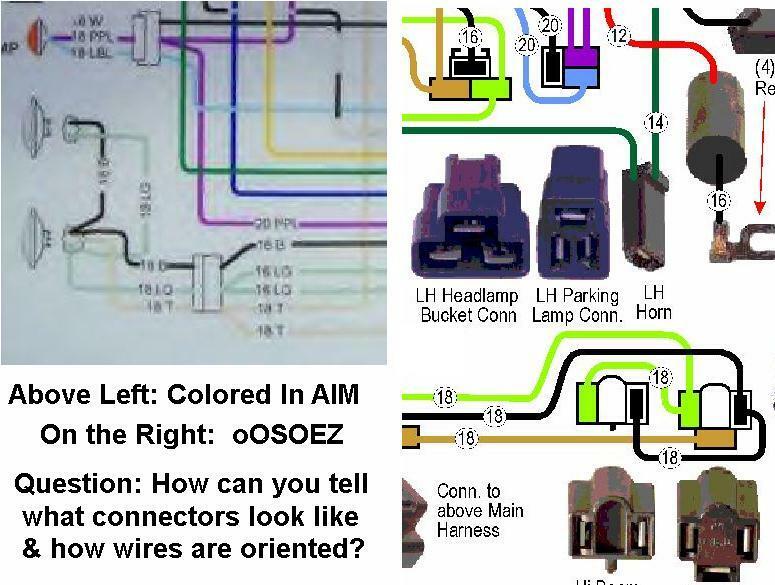 Wire harnesses don't resemble what is depicted in the AIM, even when they are "Colored In". We show just what the connector looks like, where the wires go and how they actually interconnect. We help you determine how original TI harnesses differ, how AC and heater dash harnesses differ, how dash and ignition harnesses differ on standard and automatic transmission models. You could actually rebuild your harness using our OSOEZ Wiring Guides, but not with any of the others. Period NONE. Nada. Zilch. Confucious Say: "You can't book learn a Corvette." And then present it as some Specialized Technical Engineering Achievement. LOL. "Colored In" AIM schematics are just the same old AIM "eye test" in a colored dress. I'll bet you whomever "drew them" actually just traced the AIM and never even saw any harnesses or even circuit tested a single one. How's that for accuracy? Is that ever a Technical Engineering Achievement? LOL. What is your frustration breaking point? Models currently available for 1963 through 1977. More to follow. The following are representative of the drivers side Head Lamps and Parking Lamp rounting and connectors. On the left you cannot tell anything, except pretty colors are present. Note there actually are two separate Purple wires entering the parking lamp connector. They do not splice together. Harnesses are confusing enough, without data that is misdleading. Some wires do splice and others do not. If 2 or 3 separate wires enter a connector, oOSOEZ shows it. Notice how clear the entry positions of the Black, Green and Tan wires is shown on the right. No such luck on the left. It's a DUD. No Second Guessing is needed. Can I tell what a connector or terminal looks like? My harness is missing some. Some of my wires are cut and missing. Can I tell how to re-attach them all? Can I tell where any fuse actually goes, because my fuse box lettering is worn off? Can I tell whether my harness has the right AC, Auto, TI or standard connections? Is this another ebabe colored in copy of an obsolete inaccurate GM schematic? NOTE: even when using the wiring schematics from the individual (58-62, 63, 64, 65, 66, 67) factory Shop Manuals and the individual (68, 68, 70, 71, 72, 73, 74) Passemger Car Service Manual you are not guaranteed an error free schematic, and often they don't even agree with the 58, 59, 60, 61, 62, 63, 64, 65, 66, 67, 68, 69, 70, 71, 72, 73, 74 Assembly Instruction Manuals! What a mess. Ours are accurate, because we made them from the actual wiring, not from someone elses drawing of what the wiring was supposed to look like, but wasn't like. Since GM's first ever, any illustratedschematic to the most recent Don the Engineers Colored In GM black and white ones - these has not been a single author who has held even one harness about which they "Color In" or is it write or draw. Yuck Yuck. Another vendor with a repro of a repro of a repro... Today's internet author's really are slick or are they just another fast buck artists complete with an email address at the internet factory. Sam74C3 Hey guy, I just got my wiring diagram from Dr. Rebuild today, and it is awesome! I checked into all the other's and found this one to be idot proof. 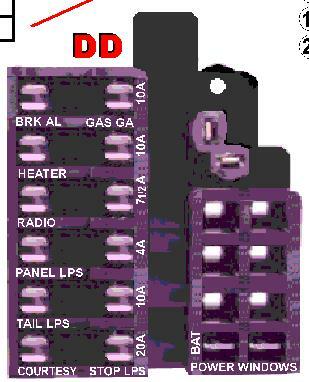 It shows all wire sizes, colors, and even detailed pictures of what the end connectors look like. My wiring was a rats nest of cut wires. 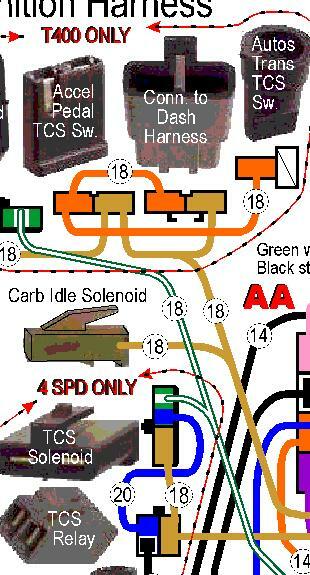 adrenaline-guy I like Doc Rebuild's wiring guide concept---looks tailor made for someone like me. I like the pictures of the actual connectors and the large 11x17 size. Ctjackster The Doc Rebuild wiring diagram is pretty neat, the correct pictures of the plug ends really helps you get your bearings. Also might want to get the full harness clip / retainer package from him for the engine harness. 69ttop502 I was just over picking up some parts at Dr. Rebuild the other day and his wife showed me one of the new wiring diagrams and it is awesome. Ron Miller I like the Doc's approach as well, especially the photos of actual connectors, fuse panel, etc., that are included!! 62Jeff the approach used in the Doc's diagrams looks like it would be very helpful if you were trying to rewire you car or debug wiring issues. 67-427ci After reading about Doc's diagrams I ordered them. They are easy to follow, excellent detail and the addition of all the plugs is a BIG plus. THANK YOU Corvette Enthusiasts. I'm glad you find them useful in your hobby enjoyment.